Tokyo, November 27, 2017 - Sumitomo Chemical Co., Ltd. (Sumitomo Chemical; TSE: 4005) today announced that it has adopted Software-Defined Networking (SDN) *1 solutions developed by NEC Corporation (NEC; TSE: 6701) at its Chiba Works and constructed a new network infrastructure for the Works, aiming at realizing a next-generation manufacturing plant driven by IoT (a digital plant). Sumitomo Chemical's Three-Year Corporate Business Plan stresses the importance of "Business and Work Process Innovation Through IoT" as one of its strategic initiatives for sustainable growth. The Company is working proactively, among other things, to realize a digital plant by leveraging IoT technologies and promote greater real-time visibility and sophistication in the Sumitomo Chemical Group's global supply chain information management. Sumitomo Chemical considers it essential to reduce a variety of risks it faces in the IoT era of ubiquitous connectivity by deploying and strengthening multi-layered networks in order to minimize potential damage from cyberattacks and unexpected failures. (1) Enables the flexible, rapid construction of a new network SDN enables the flexible and rapid construction of a Virtual Tenant Network (VTN) *2 with different security levels. This permits the application of different security policies to each system and helps to minimize the damage level from cyberattacks, while supporting systems utilizing IoT. (2) Visualizes the entire network with a GUI The use of SDN enables the visualization of network configuration and the status of communications on a Graphical User Interface (GUI) *3 screen and centralizes control over the virtual network. This allows the rapid pinpointing of a failure if it occurs and enables measures to be taken for early recovery. 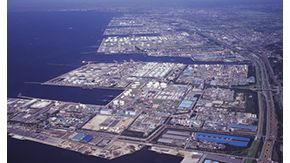 (1) Minimizes impact of line disturbance between separated plant sites Sumitomo Chemical's Chiba Works is separated into two sites, the Anegasaki District and the Sodegaura District, both of which are connected with each other by a network at all times. Under normal conditions, common network segments are in place and operated for the entire Chiba Works by controlling them from the Anegasaki District. According to the new network, a backup SDN controller installed in the Sodegaura District and "a dual cluster function" *4 enable each of the Districts to operate its own network independently of the other. Such an alignment serves to minimize the impact of a line disturbance on the entire operation of the Chiba Works should it occur in one of the Districts, thereby contributing to increased competitiveness of the Chiba Works as well as its safe and stable operation. (2) Reduces network maintenance and operation costs The use of SDN allows the Company's personnel in charge of information system operation, instead of a system engineer from an external firm, to build and operate multi-layered networks more easily while maintaining their security. As a result, it is expected that the Chiba Works could reduce the current network maintenance cost by approximately 30%. 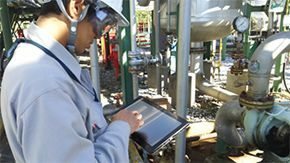 (3) Facilitates realizing a digital plant Sumitomo Chemical is working on building a system which is capable of performing on-site maintenance with a tablet PC, such as examining drawings of facilities, equipment, etc. within the plant and prepare maintenance records at the site. A virtualized network with SDN enables maintenance staff to have easy access to information on plant instruments and equipment at the site while keeping strict security measures unaffected. In addition, as part of its preventative plant maintenance activities, Sumitomo Chemical is looking into the viability of predicting potential failures at the plant by means of AI and big data analysis with the use of sensors attached to plant equipment for collecting process data. *1 SDN (Software-Defined Networking): An architecture whereby networks are dynamically controlled by software. *2 VTN (Virtual Tenant Network): A logical network that is configured by software on the common physical network. *3 GUI (Graphical User Interface): A user interface where an operation target is represented by a picture. The interface can be operated intuitively using a mouse. *4 A system that enables operations to continue, even in the event of an unexpected failure or disaster, by employing two spare devices in addition to two devices that operate under normal conditions.